It's Dive o'clock in Baja California - Mexican Dive Expedition with a Marine Biologist - Dive o'clock! It's Dive o'clock in Baja California, Mexico! Experience the wild side of Mexico and join us on this exclusive dive trip along the West coast of Mexico, the more budget-friendly alternative of the Galapagos. Get involved in whale shark conservation while snorkeling with them, dive with sea lions and maybe even see dolphins and rays while a marine biologist explains you all about marine life and conservation in this unique area. This dive expedition takes you off the beaten track! It is no wonder Jacques Cousteau described the Sea of Cortez as the 'Aquarium of the world'. Baja California is the peninsula separating the Gulf of California / Sea of Cortez and the North Pacific Ocean. It's raw, it's natural and it attracts the bigger marine life species - what's on your bucket list?! Dive with us as we head off to an area that only a few others get to explore. We offer an incredible land-based eco-adventure with various boat trips, perfect for non-diving partners to join and cheaper than a liveaboard. Learn about and join marine conservation efforts while you enjoy a fun-filled exhilarating dive trip. 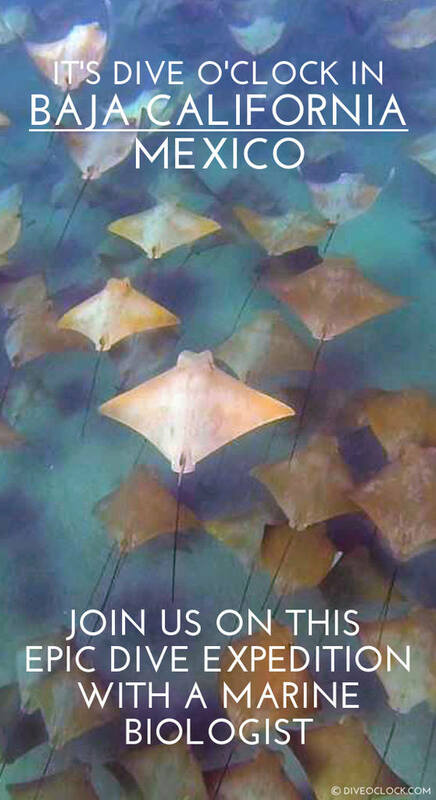 You have the opportunity to see the raw beauty of the Gulf of California through the eyes of a marine biologist. This expedition is as eco-friendly as possible but we are not going to hug any trees - well, maybe a sea lion. Expect an incredible adventure and the most beautiful interaction with whale sharks and sea lions. If you need any help don't hesitate to contact us at travel@diveoclock.com or call via Skype: Dive o'clock - Marlies (time zone in profile). We're here to help! Raw beauty awaits you in Baja California! It’s been said that the Gulf of California, also known as the Sea of Cortez, is one of the most biologically rich bodies of water on our planet. Indeed, Jacques-Yves Cousteau himself dubbed this sea “The world’s aquarium”. There are close to one thousand species of fish, several thousand species of invertebrates and a bounty of majestic animals such as various species of balleen whales, pods of dolphins, aggregating whale sharks, colonies of sea lions, mobula rays, manta rays, seabirds and more. We are committed to providing serious fun and memories that will last a lifetime for any outdoor adventurist. All components of our diving expedition contribute in some way to the conservation of the species and habitats that we visit be it through collaborative research, awareness and education or by direct donations to vital local conservation efforts on the front-line of ocean conservation in the region. We organize this trip as eco-friendly as possible and we invite you to participate in eco-tourism. You have the opportunity to learn all about marine biology and conservation at a mind blowing location. 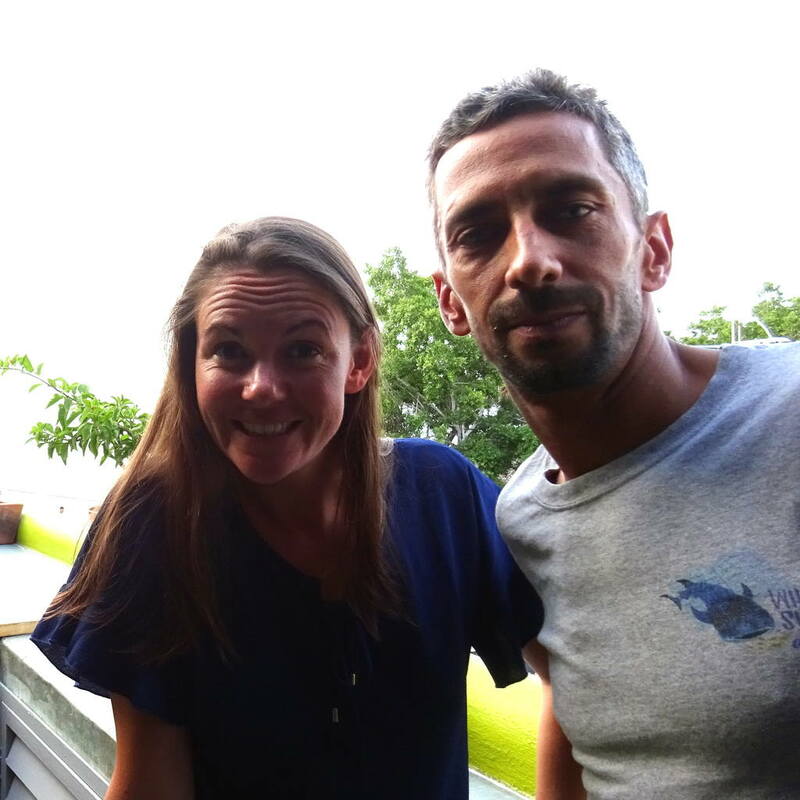 Marlies the founder of Dive o'clock will be leading the expedition together with marine biologist Jay Gittens. Since they worked together on various projects over the last years they decided to join hands to show you the beauty of the Baja California. Jay is born and raised in the UK, he has been living in Mexico for 8 years. He is a marine biologist, MSc, and the founder & Project director of Whale Shark Diaries, dedicated to the protection of whale sharks through research, awareness and education. In the region he is well know for his marine conservation actions through various projects and he is also the Science director at Ocean Sanctuaries. Jay conducts volunteer programs and internship with his non-profit organization Whale Shark Diaries. He has been teaching and guiding people about the important marine conservation work in the Baja California for years. Since 2016 he also organizes eco-tourism adventures around La Paz. Much of her live and work is dedicated to diving. Marlies, MBA, is an experienced dive guide and dive instructor with travel experience in over 50 countries. Her own dive travels has let to enriching experiences and learning a lot about marine life and conservation which she shares on this website and social media. Now Marlies wants to take others on these kind of responsible travel trips as well, to truly share the beauty of those spots. Are you are former student or dive buddy of Marlies? Did she teach you how to dive or maybe guided you on a day trip or liveaboard somewhere in the world? Time to catch up and have fun at this awesome and unique place in the world. Thursday the 24th of October 2019 we will meet at 17:00 at our hotel in San José del Cabo, Hotel Hampton Inn. Jay and Marlies will welcome you with a tasty cocktail/mocktail and a presentation about the expedition and marine life in the area. We will then head out together for a welcome dinner at a Mexican restaurant in San José Del Cabo, famous for its delicious, authentic Mexican cuisine and tasty margaritas. Time to relax and getting to know each-other while our expedition officially kicks-off. We will enjoy an early breakfast in our hotel before setting off to Cabo Pulmo National Marine Park (approx 2 hours driving) for scuba diving or snorkelling. Experience the amazing sea life here including schools of jacks or “fish tornados”, eels, turtles and an abundance of tropical fish. Reef sharks, whale sharks and rays have also been known to make their appearance! After two dives we will return to the beach for lunch. After lunch we will head back out for a relaxing afternoon dive before we drive back to the hotel. You can spend the evening as you like, explore some of the Spanish colonial architecture of San José del Cabo or join us for dinner/drinks. After breakfast, we will check out at our hotel in San José del Cabo and will head to La Paz (approx 3 hours driving). 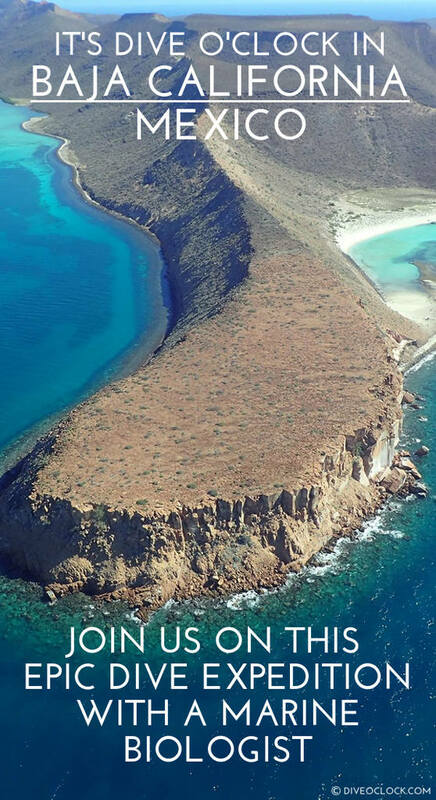 When we arrive in La Paz we will check into Hotel Catedral before heading to the stunning Espiritu Santo Archipelago National Park just off the coast of La Paz. Espiritu Santo is a UNESCO World Heritage Site since 2005 and widely considered to be the Jewel in the Crown of La Paz. Our first dive site will be at Swanne reef where we can find an abundance of fish and invertebrates and a sandy area filled with Garden eels. Look around for stingrays, try to spot colorful nudibranch and maybe even see a sea turtle along the reef filled with hard corals and sea fans. We will provide a ceviche lunch on a quiet, if not empty, beach within or close to Balandra Bay. This bay is famous for it's stunning views over the Baja California. We will explore the local beauty and wildlife while heading to San Rafaelito for the second dive. When arriving at San Rafaelito / Lobos Rock you can already see dozens of California sea lions laying on the rock or maybe even jumping in the water. 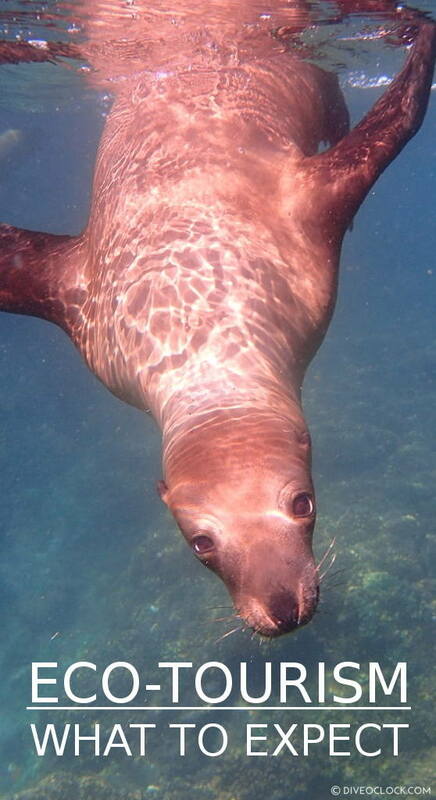 Be careful not to roll off the boat on a sea lion with your dive gear, they are literally everywhere! Enjoy the wildlife show in its natural surrounding. Swimming with the playful juveniles is so much fun. An action camera is the best choice here. They are fast! After diving with the playful juveniles we will head back to the hotel in La Paz where you can fresh-up before joining us for dinner and a visit to a traditional mezcaleria. You can also spend the rest of the afternoon and evening at your own pace, explore the Malecon / boardwalk of La Paz or whatever else your heart desires. All is good, it's your holiday! After breakfast we’ll meet at the dock at 11:00 to head back to the Espiritu Santo Archipelago, this time we will go on a full day trip to explore the islands further North. This day will be filled with incredible dive sites, snorkeling spots at pristine beaches and exploring stunning bays and coastlines while learning about the history and marine life around Espiritu Santo. The famous El Bajo seamount will be our first dive site, for the chance of hammerhead or silky sharks! Los Islotes the northern-most point of the island group that is home to a colony of around 500 California sea lions!!! Here you will get another dive with these magnificent creatures and if you happen to get tired of these playful animals (which we highly doubt) - continue the dive on the reef. After the dive we will head to a beach were we will prepare a delicious lunch for you while you can swim or snorkel in the turquoise blue water. We will stop by in Bahia San Gabriel, a beautiful sheltered bay that is home to around 1000 breeding pairs of magnificent frigate birds. 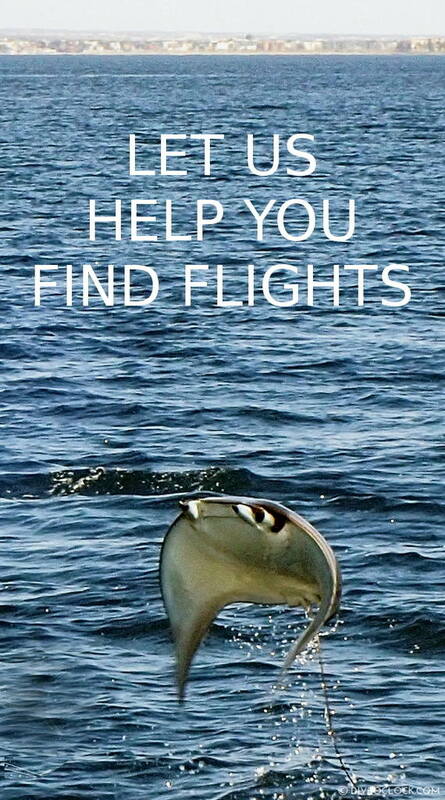 Don't be surprised if we can spot dolphins, mantas or maybe even a whale from the boat as well, the season is on! As soon as the sun sets we will get ready for our night dive at the third dive spot of the day. We will stay a bit shallow to hopefully spot some ray species and of course the 'creatures of the night'. Life underwater is definitely different at night, we will tell you all about it. The return to La Paz will be around 19:30 where you can have dinner and spend the evening as you please. You are also welcome to join us of course. After breakfast we’ll meet at the dock at 09:00 to board the boat for our special whale shark excursion. You will have multiple opportunities to snorkel at a safe distance from whale sharks and be involved in conservation work. 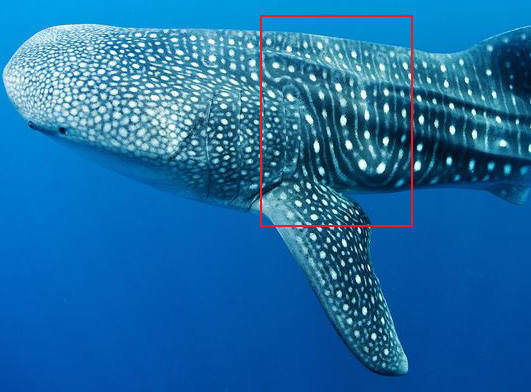 The whale shark excursion lasts around three hours. After swimming with the mighty fish, we will go back to the port and have lunch in a restaurant on the Malecon / boardwalk. In the afternoon we will head on to the beautiful Balandra Bay! This landmark is reachable by a 45 minutes rocky hike up the hills of Balandra. Now you can really see those stunning views over the Baja California. Take photos of this incredible scenery before heading back to the hotel. Upon our return in La Paz there is time to refresh, relax and have dinner on your own while we prepare the Expedition wrap-up held at 8 PM. During the wrap-up we will present how many whale sharks we have encountered, the collected research data, contributions to whale shark conservation and sea lion rescue and more. Of course this is the perfect moment to reflect on our trip, sign logbooks and have a last cocktail/mocktail all together before preparing for departure the next day. Breakfast at your own pace and then depending on departure flight times you’ll head back to San José International Airport for your return flight. It’s time to say goodbye to new friends and to your hosts and we are certain you’ll take many special memories away with you. Select Contact us today to book your once in a lifetime adventure. We will take photos and videos of you above and below the surface. These will be FREE OF CHARGE. We cannot guarantee the quality of underwater photos and videos as visibility and opportunity vary. This trip is suitable as an add-on for your holiday. If you want to stay longer, extend your trip - contact us. We are happy to help. This is an exclusive Dive o'clock trip with a limited number of participants. We are not going to split the group, we keep this dive expedition small and personal. The absolute maximum number of participants is 10 people, adults only. If you want to join with more than 4 people/friends, please send us an email first. Whale Shark gift when the trip is confirmed! When we can confirm our trip, we have four participants, we will send you this lovely whale shark necklace to show your excitement for seeing the biggest fish in the world. Jay partnered with a local accessories and jewellery designer, Gina Minivora of Minivoro Accesorios, to produce these gorgeous whale shark pendants. They are handmade from polymer clay and coated in resin, so are resistant to humidity and very durable, with internal metal reinforcements in weaker points such as the fins. Polymer clay is non-toxic, even if ingested. 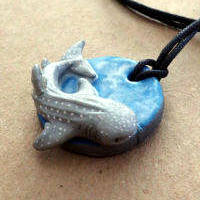 The pendants are roughly 1.25 inches in diameter and consists of a disc which represents the Blue Planet with a whale shark mounted on top. “Whale Shark Diaries” will be etched on the rear of the piece or you can have it personalized for an extra fee. The pendant is mounted on an adjustable black waxed cotton cord and will come in a small paper gift box. This is an expedition with a small number of people, you are committing to be an active participant. If the trip is cancelled before September 1th due to not reaching the minimum number of participants the deposit will be refunded. The deposit is non-refundable in any other way, with cancellation you only loose your deposit. We can't guarantee wild life, but if we are really unlucky to see no whale sharks or sea lions - we will do our best to reschedule another attempt. If you depart from Los Cabos or Cabo San Lucas airport we can also schedule your last night in San José del Cabo and drive you there after the Expedition wrap-up. This might be affected by the flight times of other participants as we do our best to combine transfers for various reasons. We don’t accept any responsibility for your personal belongings nor any responsibility for risks inherent to (but not excluded to) diving. If part of the expedition is cancelled due to unexpected situations no refund will be provided. By paying your deposit you agree on these terms and conditions.